I opened the book, figuring I could read the first couple of chapters and then head to bed. I ought to know better. As always, Warren's characters grab me from the opening pages. I was hooked, and stayed up until the book was finished. I'm pretty sure I've said something similar about nearly every title of Warren's that I have read. As always, Warren nails "Minnesotan" which undoubtedly helps me to feel like I know these characters. I love historical fiction that actually teaches me something or gives me more insight. Her books always do. I like characters that make mistakes and have flaws. I love Christian fiction that doesn't preach. You can see what others had to say by visiting the Baby, It's Cold Outside blog tour page. 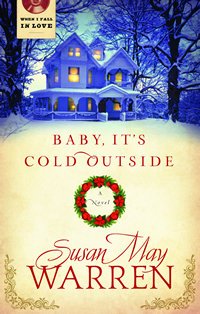 Warm up to Chrismtas early this year with Susan May Warren's Baby, It's Cold Outside! To celebrate the release of her new Christmas book with Summerside Press, she and the publisher are giving away a Kindle Fire and hosting an early Christmas Party on Facebook! Enter today by clicking one of the icons below. Giveaway ends on 10/26! This sounds like a fun read. As I grew up in Minnesota, I particularly enjoy book set there. I will have to seee if the library has it. I wished I had made this tour :) I'll have to see if my library can get it so I can read it!